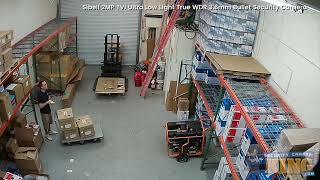 Here’s the TVIOB-SBS2IR, a brand new 2MP TVI bullet camera from our Sibell line of security products. This camera will work with recorders that are compatible with the TVI technology and especially with our Quad DVRs. With a resolution of 1080p (1920 × 1080), you’ll be able to view detail in high definition! A 3.6mm fixed lens allows placement in a variety of locations and an IP67 weather rating and ability to work in temperatures ranging from -40°F to 140°F make this a perfect camera for indoor and outdoor applications. This camera works using a standard 12V DC power supply and a good quality Coaxial cable that many of you will have in place from previous installations. You’ll be able to access the OSD menu using COC (Control Over Coax) directly over the coax cable to make changes to settings like Brightness, Sharpness, Mirroring and many more like BLC and HLC to help you configure this to your specific conditions. The TVIOB-SBS2IR is an Ultra Low-Light camera with a minimum of 0.005 lux @ (F2.0, AGC ON) which means that it can stay in color using just the ambient light available. For you, this means that it won’t switch over to the black and white IR (up to 65 feet) until you have virtually no light. Speaking of IR, the Smart IR can determine the strength of the IR so you have better visibility in certain environments or it can solve over-exposure when an object is too close. This also features True WDR @120db that helps to eliminate many of the problems you may be having with glare from light. Purchase this camera from Security Camera King and you’ll get FREE US based tech support for the life of the product and a complete 2 year warranty. Purchased 2 ea. cameras that arrived today, so I installed one already replacing a 5MP camera. I am thoroughly amazed that the clarity is better than the camera it replaced. I had a little trouble accessing the OSD menu, but figured it out. Made some minor adjustments, and will make some more when it gets dark. So far the quality of the picture I'm seeing on my screen is excellent. I think I will replace my other cameras too, as I am some what disappointed by the claim of them being 5MP. These outshine them in every way! !